Fresh from being voted one of the 10 best independent menswear stores in the UK by Esquire Magazine, Leeds’ long running independent ‘Hip’ are back with a new, all singing all dancing website just in time for the start of AW14. As a regularly-ish visitor to the store in it’s the former Thornton’s Acade premises, I’ve always associated Hip with bringing original, emerging brands to the City; whether it be limited edition pieces, designer collaborations, or global imports. The store has always been recognised for stocking brands who strictly monitor their UK distribution, (limited numbers of pieces and limited stockists) which has led to the store building a reputation based on quality and exclusivity, all without the slightest hint of pretence (no mean feat). In regards to their new web store, the design is simple, clean and lets the products on show provide the colour; with my only gripe being the lack of close-up pictures displaying the detailing on each garment. Overall though I’m impressed and to give you an idea of Hip’s current stock here’s my favourite five from in-store. 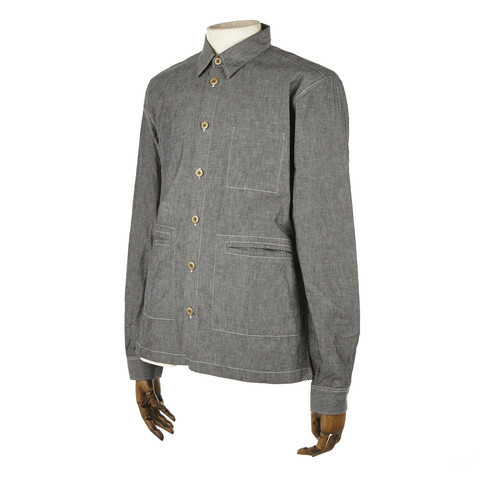 A jacket style shirt from London based Folk constructed from 100% cotton and featuring a square cut hem, internal chest pocket and two front pockets with stitch detail. British workwear at its best. Issue 10 of Design & Culture magazine ‘Inventory’ includes features on Japanese menswear brand ‘Orslow’ and New York based wholesale distributors ‘Nepenthes’ who we mentioned on the blog a few weeks back. Made from Japanese cotton and featuring a cool zip placket, Our Legacy are right on the money with this interesting Shawl Zip Shirt. The floral design give it bags of character. In my opinion, Universal Works are probably best emerging British menswear brand of the last 5 years and they back for AW14 with this ace fishtailed Mil Parka. Features include a cotton waxed outer body, fleece lined hood, 4 external stud pockets and a drawstring hood/waist. Spanish Shoemakers ‘Vera’ produce some top footwear and the ‘Lisbon’ is the Vera of all Vera’s. It’s a casual moccasin featuring a thick rubber sole, rawhide laces and a leather insole, meaning it’s a tough little bugger and a solid choice for late summer/early autumn footwear. For more of the same, head over to Hip’s new web-store on the link below and Iet me know your thoughts on their new site?